I have a favorite spot that I like to walk over and over again just to look at the flowers. Space the walks a week or two apart and there's different flowers blooming each time from earliest spring until winter cold sets in. My flower trail is an old logging road on the farm that includes a draw with a spring branch, but almost any walk in the woods will yield the same finds. And, walking is the best way to see the flowers. Although they bloom profusely along the roadsides and you may see many of them from your car, a walk in the woods is a lot more fun. The earliest bloomers are Dutchman's Britches and Dogtooth violets. Walking up a small spring branch, I can find them on the first warm days growing all over a moss covered bank on the south side of the mountain. The trumpet shaped violets are creamy pink and stand up on a long, slender stem. Their curiously spotted green and rust colored leaves are ovals about four inches long that curve tightly around the base of the stem and then open out to let the flower stand alone. The Dutchman's Britches are a string of little white flowers, shaped just like tiny knee pants hung upside down to dry, on a nodding stem that reaches upwards from a base of ruffled light green leaves. Both are prolific and easy to find. About the same time, the purple violets will also bloom and it's only a few more days until Shooting Star and Trillium appear. The shooting star's leaves are all clustered at the base and it has a long stem that may support several of the white flowers. The Trilliums have a heavy stalk with the deep burgundy, white, green or brown flower nestled in frame of wide leaves at the top. A rarer find is the Jack in the Pulpit but if you look in rich, wet spots you may spot some blooming in the spring or bearing a cluster of red berries in the fall. The "pulpit" is pale green to deep maroon and is cupped-shape with a hood arching over the green spadix. Another early bloomer is the wild columbine and I usually find it on the ledges and bluffs down on the creek level. They're nice because they bloom so long. You can go back and look again and again. They may start as early as March and bloom until August. Their red and yellow flower hang from slender, nodding stems with the five long hollow spurts pointed upward. The pretty, lacey leaves are mostly at the base. If you are familiar with the cultivated varieties, you won't have any trouble recognizing these. Along the roads and in the woods, the redbud burst into bloom, their tiny mauve clusters making a pink cloud around the bare limbs of the small trees. When the leaves begin to appear the flowers are soon gone, but the dogwoods should open before that happens. Climb the hill above a dogwood tree and look down. The branches spread out in flat layers with branches stacked slightly askew up the tree, so you look on each layer as its own separate flat white cloud. There's never enough days to look at the dogwood all I want, but the consolation is that soon after they've finished and put on their leaves, the wild azaleas will bloom. Often you'll catch a whiff of their heady perfume wafted on the air long before you find them. There may be a single bush, but usually where you find them you'll find others scattered over the same area and often a profusion of bushes in shades of pink ranging from almost-white to almost-fluorescent. They like acid soil and are usually high on the slopes. I find them on the north side of the hill above the barn and like that they are scattered through the trees here and each bush is a new "find". March though May brings such a wealth of blooming things, it's impossible to identify all of them. The blackberries make drifts of snowy white in old fields and sunny spots in the woods and wild raspberries add their blossoms to the ground-clinging dewberries and the tiny wild strawberries. Plum thickets start as clouds of white then become pinkish as the flowers begin to die. They love roadside right-of-ways and edges of fields. You won't have any trouble finding May Apples (Mandrake). The big stems support an umbrella-like top of huge leaves and the flower hangs on a fork of branches beneath. In late summer, they make a light green fruit which is sometimes used in making jelly. The Indians and early settlers used the plant for a variety of home remedies as well. When they begin poking through the ground, you'd better have time for some serious mushroom hunting. The morels will also be up! Spots where the sun reaches through along my old logging road are covered with field pansies, little two to four inch tall plants with four petaled white to pale lavender flowers. The lower two petals will be veined in purple. Incidentally, this plant was considered a cure for consumption by our pioneers. Along with them is the darker, larger, and showier birdfoot violet. It has deep purple upper petals and lavender lower petals and may be found a few at a time, but I often see them in yards-long stretches on a roadside bank. It's a tradition with our family to go around to the north side of the hill about the same time the azaleas bloom for the sole purpose of looking at the dwarf wild iris. They look just like the tame variety, but the plant is tiny, rarely more then four inches high. There will be big beds of them wherever you find them, which is usually on the high parts of the hills. In summer, daisy fleabane takes over open fields and rich woods. The flowers are 150 or more white to pale pink rays around a yellow center and the plant is tall an branchy with very few basal leaves. Their companions are the bright orange butterfly weed, which may start blooming in May, but seems to love August best. The milky stem supports feathery clusters of tiny flowers. You'll easily tell how it got its name - the butterflies are always thick on the flowers. Makes pretty photos! Summer roadsides are lined with daisies. The white ones are prolific, so pick away if you want a bouquet. For a fun project for kids, stand them in a jar or water with a little food coloring in it. They'll take on the color of the water. Mixed in the daisy fields, you'll find purple cone flower and black-eyed susans. The cone flower has a tall cone center standing up around petals of lavender and the black-eyed susans have bright yellow petals around a black center. The ox-eye daisy is a summer bloomer, too, and continues through fall. The flower heads are 15 to 30 white bracts around a bright yellow corolla. The swamp aster or Michaelmas daisies with their clusters of lavender petals around a bright yellow center grow along roadsides and in sunny spots in the woods and are an accent to a gaudier bloom that loves the same places and is equally widespread. The goldenrod blooms from August to frost in feathery clusters of tiny golden flowers on numerous upper stems. 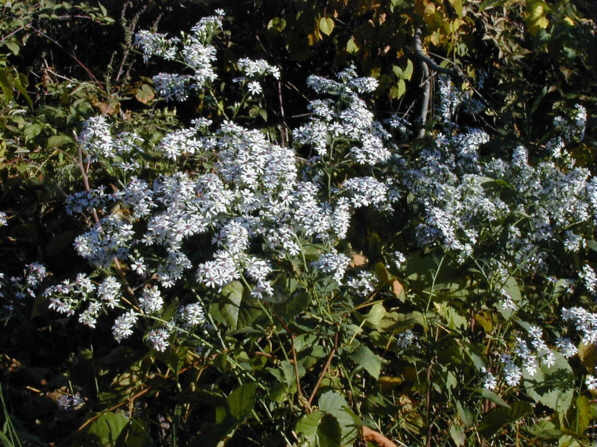 It is a tall plant with narrow leaves with prominent lateral veins. The two add a rich ground-level array of color to the flaming trees of fall. When my sister was little, she couldn't say Michaelmas, so the purple flowers became "Mickey Mouse daisies" in our family. Take any trail, logging road, or quiet country lane for a wildflower walk. You'll find many more and take home a new appreciation of the diversity of the natural beauty of Arkansas. One final word. Heed Park Service and Forest Service warnings about digging or picking plants on their land and get private landowner's permission. Wildflowers are usually delicate and don't transplant well, anyway. Once one of the kids begged me to pick a bouquet of wild iris. I knew they would wilt before we got home, so I made a video of them instead. She still has her bouquet, as fresh as ever!